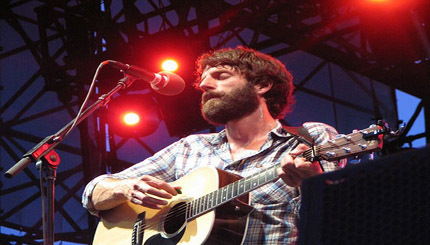 Raymond Charles "Ray" LaMontagne (pronounced /lɑːmɒnˈteɪn/) (born June 18, 1973) is an American singer-songwriter. Reportedly, after hearing a Stephen Stills song, LaMontagne decided to quit his job at a shoe factory and pursue a career in music. He has since released four studio albums, Trouble, Till the Sun Turns Black, Gossip in the Grain and God Willin' and the Creek Don't Rise. In the UK, Trouble was a top 5 hit, and the title track of the album was a top 25 hit. Till the Sun Turns Black was a top 40 hit in the U.S. A soft-spoken person who is known for his raspy voice, LaMontagne has won a number of awards for his music and has performed at several charity events.